Easy-to-use app for immediate productivity. AutoRebar is an app that provides Autodesk® AutoCAD® (and all vertical products) with an extra toolbar with specific objects for rebar detailing of reinforced concrete structures. 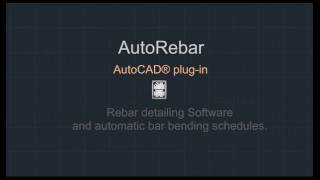 With AutoRebar you can now easily produce high quality drawings quickly by automating the repetitive tasks previously involved in rebar detailing. You can now focus on the conceptual part of the design rather than deal with time-consuming traditional CAD editing work. There are four types of dynamic objects: Rebars, Marks, Call-outs and the BBS. The Rebar objects can be created and stretched like polylines and the bar size quickly edited with a double click. Since all AutoRebar entities are graphically connected, the linked Marks and Call-outs update automatically. The user can add a new Mark by selecting the Rebar to be linked, and double click it to edit data such as the bar grouping criteria, the bar spacing and the size of the range. Alternatively, normal AutoCAD dimensions can be linked to the Mark and used to specify the range of a bundle of bars in the concrete structure: AutoRebar calculates the total number of bars in that range. The great thing is, whenever you modify the concrete shape and stretch the dimension, the total number of bars updates immediately. The Bar Bending Schedule can be either inserted in the drawing or exported to Excel with a simple click. Meanwhile, the EXPLODESEL and EXPLODEALL commands explode the AutoRebar objects into standard AutoCAD entities. This can be useful to deliver your drawing to other users who want to open and edit the.dwg file without having to install AutoRebar on their computers. AutoRebar fully implements both metric and imperial units. The installer is compatible with Autodesk AutoCAD 2020, 2019, 2018, 2017, 2016, 2015, 2014, 2013 (including all vertical products). The app is helping a lot. You need to spent some time in order to learn what you can do with it, but once you do that, you will find that it really helps save a lot of time with the drawings. It may cause some Autocad instability but the owner of the app was quick to reply and give a solution. For those who do not have a proper lisp may be useful. The ods are that it does not add stability to AutoCad, has to be exploded, does not allow different rebar list in the same drawing. My solution was to make the rebar drawing with a formwork external reference, then explode and use the exploded file for plot. All the proscess was heavy and time waisting, and also lead to mistakes..
Programme très utile pour dessiner en Génie Civil et Construction. Précision extrême et simplicité d'usage phénoménale. Easy to work and learn. Very fast for small drawings generation.